Yes. I'm that person. I sat down and wrote a list of new (school) year resolutions. And I'm not even sorry. Plus, it's less than half way through day one and I've only broken two of them so far. Result. I always see a new school year as a fresh start. More so than the actual new year. Must be all those new uniforms, shoes and bags, meaning I'm almost as broke as I am after Christmas! I'm the type of person who fantasises about being super organised. I have a planner and the best of intentions, but always seem to fall slightly flat. But not this year, my friends! No. Get ready academic year 2015/16; I'm coming for you! ✚ Do everything the night before (uniform out, shoes cleaned, school lunches made). ✚ Write all clubs, classes, parties, trips, deadlines down as soon as I get them. In one place. That I will refer back to daily. ✚ Eat breakfast. And don't buy biscuits. Because I will eat them. ✚ Write a plan each week - for meals, activities, work outs, blog posts. Everything. It's easy not to bother when I'm at home all the time, rather than work, but I probably need it even more to keep me motivated and make sure I don't forget things. ✚ Make dinner before I pick the kids up from school, if possible. I love having everything ready in advance. Makes me feel a bit like Nigella. Unless it's chicken dippers for tea... they're not so good cold. ✚ Get outside every day (not including soggy school runs!). Even in the rain. The shortest of walks can make all the difference and fresh air works wonders. ✚ No wine! Monday to Thursday is a grape-free zone (disclaimer: unless I have a really bad day, then wine is allowed). ✚ Get to bed (and preferably to sleep) before 11pm each night. The previous resolution should help with that. ✚ Tackle a room each week. By that I mean a deep clean or decluttering. I cleared out Dylan's wardrobe/toy cupboard/black hole of crap last week - it was bloody horrendous at the time, but I feel great now it's done. ✚ Enjoy every single second of my time at home with Ayden. This time next year I will have just dropped him off for his first day of school. I can't even think about that for too long... waaaah! Do you make a new (school) year resolution list? I'd love to hear yours. Really great list of resolutions, it's actually so handy to have everything written down isn't it? I love the look of your diary, really pretty with the pink and gold. The making tea thing - that's the one I struggle with - I can never think what to have. I must get into the habit of meal planning! Oohh that planner is so pretty! I'm tempted to make September resolutions just so I can buy one! Some great tips. My eldest starts reception next week, and my oh has just got a job after being out of work since our eldest was born. I've now got to manage a 4 year old, 2 year old, 9mo, school runs, housework, a blog and a business on my own in the week so really need to get organised! Ha ha, that's a big list of resolutions. I've not made any other than getting N to and from school, and even then it's a little flaky given the school seems to have changed the rules about dropping off without telling anyone. What great little goals you've made! I'm a teacher and have made similar goals myself.... I wonder how long I'll keep them!! 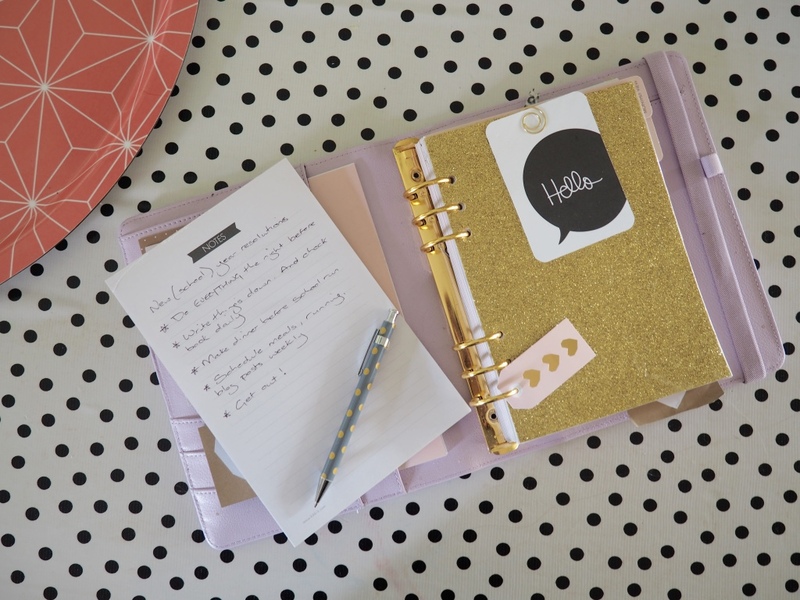 I love back to school resolutions - I always make them too!